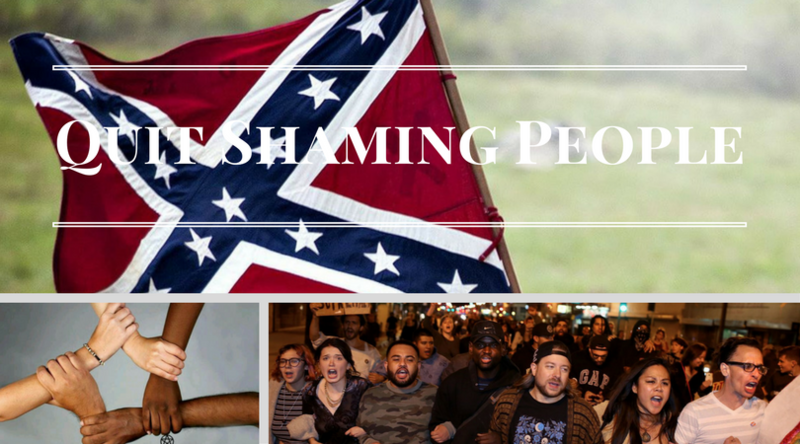 Quit Shaming People that Fly the Confederate Flag. Often times, the Confederate flag is used throughout the nation as a symbol; especially in the South. The burning question, however, is what the flag is symbolic for. This topic is not new, and researchers and scholars alike have been sharing insight into the underlying meaning of the flag. The reason for inquiry into this topic, is directly related to the recent pushes to remove the Confederate flag from atop various state capitols because of the shooting that occurred by Dylann Roof. There are questions still surrounding its reputation, such as southern heritage, slavery, and the legitimate history of the flag itself, suggesting that the meaning of the flag is not absolute, and often lies within the person. The aim of this article is to inform about what the flag means, while simultaneously giving reasons as to why shaming people that fly the flag is not the way to traverse into a more successful society. The Confederate flag represents southern heritage to many southerners, as well as other factors. This symbol of heritage means that rather than directly being used in support for enslavement, it is a way to show pride for a dissipating way of life to many southerners. According to Wallace Best, a professor of Religion and African American Studies at Princeton, the Confederate flag might act as a symbolic or religious meaning to southerners, which is why the flag garners so much controversy when brought up. Furthermore, the Confederate flag might be the way that the celebrated histories of Generals Robert E. Lee and Stonewall Jackson, as well as the president of the Confederate States of America, Jefferson Davis, are kept alive. Calls to prohibit battle reenactments, emblems, and monuments are made out of actions to fully “emerge” from the times of the American Civil War. These requests are made from an emotional standpoint from one side of the debate, and that to completely remove all things related to the Confederacy, such as the Confederate flag, would be wrongful. Essentially, southerners cling to the Confederate flag because of the many successful Civil War time generals, as well as remembering ancestors that fought for the South and the idea that the flag shows patriotism specifically to the South — southern pride and heritage. Whether one agrees with this point of view or not, many people cling to the idea that ‘because their ancestors died for that flag, they should honor them by flying it’. Often times it is next to impossible to change their viewpoint of the Confederate Flag. When approaching those individuals with this mindset, it is important to always be respectful to that person, regardless of how you might view their ancestors — or what their ancestors fought for. The point is, you should never assume that the person flying the flag is automatically a ‘bigot’ or ‘racist’ unless they actually act or speak in a way that would suggest otherwise. Shaming these people into thinking they are in the wr0ng usually leads to them flying the flag in spite of these assumptions. When it comes to the weathered past of the Confederate flag, research shows that slavery and oppression are often main factors when discussing the flag. Some research shows that the flag “serves as a vestige of slavery”, and that it conveys the message that blacks are inferior to whites. Furthermore, the flag is known to embody negative connotations to the majority of blacks, not just in the South, but all across the nation. The Confederate flag will always represent a connection to slavery, oppression, and Jim Crow to some southerners. It is apparent that many southerners believe that the Confederate flag has too many negative connections and associations to stand for ideals other than slavery and oppression. Many of the southerners that believe this, also concur that when the “Stars and Bars” show up in history, it was in rebellion to those that fought for equality and during times of remembrance for many members of southern communities. Many times, people with this viewpoint have ancestors that suffered during the Civil Rights movements when the Confederate flag was used to represent the idea of ‘anti-establishment’ and ‘white pride’. Naturally, individuals that are against the Confederate Flag cannot be shamed into not flying the flag, because they would not be flying it in the first place. However, in order to convey their message best, they should approach the contary viewpoint in a manner that does not try to belittle someone all because of a controversial flag. When examining a historically entangled subject such as the Confederate flag, one can conclude that the main identities associated with the flag are southern heritage and slavery/oppression. The research shows that there will always be at least two sides to the story, but where the difference can be made is by promoting civil discourse with the goal of bettering society in the future, by acting now. The goal should not be to shame the opposing viewpoint into thinking they are any less of a person just because of their past. Not only is this relevant to the Confederate Flag, but also to just about anything in today’s society. In the past election, some say that the democratic party lost because they have shifted from ‘The Party of the People’ to ‘The Party of Feelings’. Rather than taking action and forging consensus, many people tried to shame opposing viewpoints into thinking they were wrong and lesser of a person. 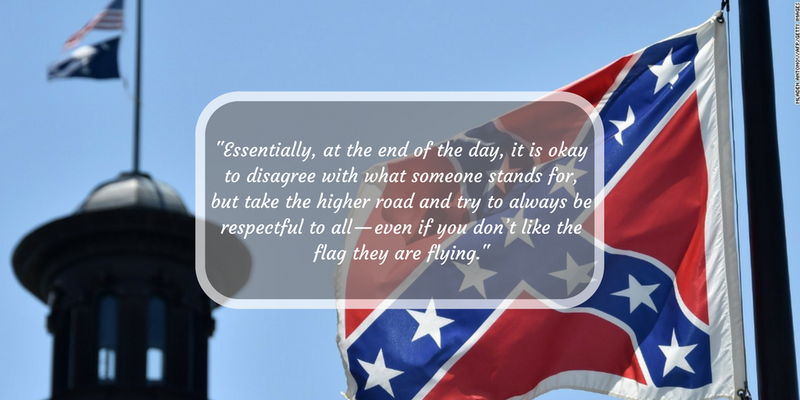 Essentially, at the end of the day, it is okay to disagree with what someone stands for, but take the higher road and try to always be respectful to all — even if you don’t like the flag they are flying.